Flowers come in all shapes, sizes and colors, and as a floral designer it is great fun to create new and different looks and styles. There is truly something for everyone. This spring, I had the pleasure of participating in the Society of American Florists’ media workshop, where we educated national magazine editors on trends in floral design. For the workshop, I created the following eight floral pieces, depicting trends inspired by my esteemed floral industry colleagues, Bill Schaffer, AIFD, Kristine Kratt, AIFD, and Rich Salvaggio, AIFD. Green and brown hues dominate in forest-like elements with accents of purples to create an eco-friendly look. 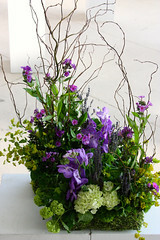 Mosses, barks, herbals and natural elements combine with shades of purple. Surf, ukuleles, tikis. No, I’m not planning a summer vacation to Hawaii, but believe it or not, reliving Philadelphia this past March. Yes, you read that right. Philadelphia in March. It’s true. Walking around the Philadelphia International Flower Show, the world’s largest indoor flower exhibition, transported me to the South Pacific with its 2012 theme, “Hawaii: Islands of Aloha.” Exotic plants and blooms surrounding you as far as your eye could see. Twenty-five foot waterfalls, lava rocks and pseudo volcanic activity, sounds of tropical birds and live hula dancers filled the floor for all to enjoy. And the stars of the show were the tropical flowers. As we look forward to the days of summer, many things conjure up memories of sunny July days and warm August nights; flags flying from houses, emerald green lawns, and brightly colored flowers blooming against white picket fences. The most celebrated flower of summer is the rose, and it’s not only in master gardeners’ landscapes that we see a plethora of these beauties. Many flower shops across the country are offering roses in all shapes, sizes and colors at a tremendous value during the summer months. A wedding cake with a scattering of rose petals at its base and a cluster of coordinating blooms matching the bride’s flowers on its top tier makes a beautiful its top tier makes a beautiful picture. And there are many more possibilities for decorating wedding cakes with flowers. Florists from all around the world are making bold statements with blossoms on and around cakes in breathtaking fashion.